Quality and cost are the two big things that will influence your decision in choosing a production company. We drink a lot of tea at our offices and we take it pretty seriously. 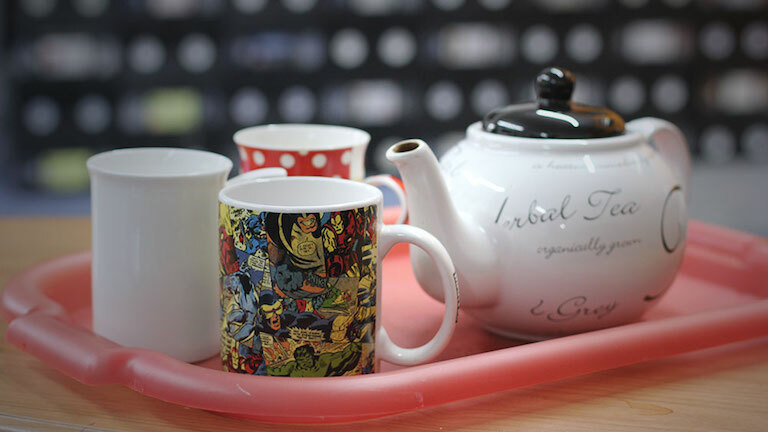 We have a teapot with tea cozy and a simple rule that nobody in the office can refuse to make tea when asked. Two of us insist on drinking from a china cups and Rob has his Marvel mug. At the beginning we sampled every make of tea we could get our hands on. We went from all the household brands to independent suppliers. From tea bag to loose tea leaves, English breakfast to Assam. After all that, two things came into play Cost Vs. Quality. When you drink as much tea as us it can be a pricey outgoing. The cost was easy. Tea has a price – just like video production services! The question of quality was a little more challenging. Loose Assam tea leafs where the best tasting but the most expensive. The cheaper brands naturally were the ones that tasted the worse. We had long discussions about which was the best and why. Tough choices were made… Did I mention we take tea pretty seriously?? When choosing your video company, you may have to make tough choices too. But the great thing about choosing video production companies is you can see the quality of their work before you pick up a phone. Firstly, view their work from a technical point of view. Is the sound audible and clear? Do the images jar or cut together well? Are things too dark? Too bright? If you hire a production company there should be no excuse for poor technical quality. Secondly look at how the videos engage you. Bare in mind you might not be the desired audience, but did you understand the message? Did you learn something? Did it tell you a story in a coherent way? Lastly look at the style. Is it visually pleasing? Do you like the tone and pacing? Are there new or interesting techniques that appeal to you? Try and imagine your video presented in a similar way, and ask yourself if that is what you are after. The levels of quality will naturally be reflected in the costs. As is normally the case, the higher the quality the more expensive it will be. Only you can decide where you compromise. In our case we aim to offer the highest quality for all our clients. Ideas have to be possible within budgets. The higher budgets allow us to be more creative with our style. But we do have a great diversity in the range of budgets we work with. We would never compromise on technical quality and clarity of the message. We have a quality policy that outlines exactly that. We have to ensure our product does not suffer from technical faults and always meets the needs of our clients. If we don’t think your budget is enough to do what you want it to, we’ll be the first to tell you. We offer a complete peace of mind service that is open and honest. If we say we can do something we do it. This adds another dimension to what to think of when you choose your production company. The price might be right, the quality might be great, but can you trust them to deliver what they say they can? It’s always best to meet them face-to-face first just to give you that peace of mind. Maybe over some tea! In the end we all have to weigh up quality with cost before deciding where to spend our money. And for the record, we went for Yorkshire Brew and haven’t looked back. It’s the best of both worlds, great tea at great prices.